If you’re just stopping by for the first time, you should know that this blog explores the intersections between indie rock and craft beer. One aspect is simply the fact that we all love rock music and beer. The other aspect is the intersection between indie and craft. For me it’s obvious, but for others, it’s a stretch. Indie is short for “independent.” To be independent, one must be self-sufficient, free from the tyranny and limitations of corporations more intent on making a buck than putting out a good product. Independent rock music and music labels are considered such as they are not a part of corporate owned music factories. There are only 3-4 of these major labels left, but they are huge. Still, as the majors deal with the handcuffs of corporate profit margins, indie labels are free to let their artists create. Craft is generally considered a type of skilled work. Historically, craft was judged not only on quality but also quantity. In order to maintain a high level proficiency the production had to remain small. Larger production tends to remove the craft, creating product with increased simplicity and often more defects. When craft is increased, volume tends to shrink, but the quality of the output is pleasurable. Indie and craft meet in both the music and beer industries. Indie labels also happen to demonstrate a fair amount of craft among its artists. This focus is lost in the craft at the majors as the shift is toward making music that satisfies corporate bottom lines takes precedence. And craft brewers are the most independent of beer industry as they provide a higher quality alternative to the three or so corporate beer producers. One could really call them craft rock or indie beer if it was desired and neither would lose meaning. Now, don’t get me wrong, both indie rock and craft beer have intentions to make money. How else would they live? The difference between these guys and their corporate counterparts is that they won’t put profit ahead of the craft or their independence. Sure, some indies and crafties have sold their souls to corporations, but they are the exception not the rule. The indie and craft movements are about small scale and high quality. Corporations don’t know how to do this. And we’ll gladly pay for whatever indie labels and craft breweries are selling despite higher prices. Even during this recession, these labels (as well as the stores who sell them) and breweries have seen steady growth. Craft beer especially is growing at an incredible rate. Even during economically hard times, we’ll find the money to support independent, craft producers of our favorite goods because we know that their products are worth it. This is no truer than it is for indie rock and craft beer. Despite the success indie/craft producers are enjoying, our corporate overlords still rule the markets, but their share is shrinking. The large, corporate breweries are watching their sales drop as is the industry as a whole. However, craft beer continues to grow. The music industry is suffering as well. Yet, more and more indies are popping up all the time and they continue to put out music. If there’s room for these smaller players in their respective industries, then they must be doing something right. So, the indie and craft markets are what’s king these days. They may not own high percentages of their markets, but they have found sustainable business methods that feature slow, controlled growth and a focus on the craft. They maintain their independence through their success. This is where they intersect. I think there’s a lot we can learn from indie rock and craft beer. That’s where this blog comes in. If I had time and this was my full-time job, I’d provide you with a lot of statistics. For now, you’ll just have my opinions and vignettes to go on. 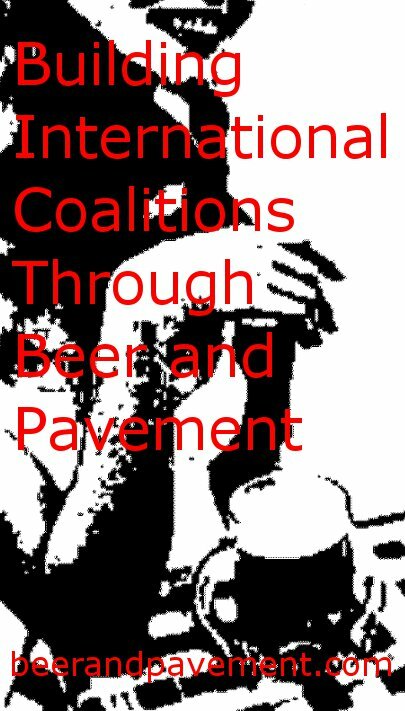 Here’s to building international coalitions through beer and Pavement and here’s to indie beer and craft rock. I like that. Indie Beer. I have always felt this uneasy feeling in my stomach every time I hear “Craft” Beer, mainly because I believe the expression drips with snobbery. From now on, I’m an Indie Beer Drinker! I’m interested in the intersection of the DIY aspect of both these endeavors. For instance, we brew our own beer at home. We combine our knowledge, tastes, aesthetic, etc. and produce something that is, in many ways, superior to what you can get commercially. It’s also ethereal, short lived (if you’re doing 5 gallon batches), and sometimes hard to reproduce what with the random vagaries of the homebrew environment. Where music is concerned, we also combine our knowledge, tastes, aesthetic, and chosen instrument to create something that commercial music (and even independent music), simply can’t touch. That is, the immediate experience of playing music with friends (or alone), creating something that will likely be short lived, and won’t be reproduced the same way twice. All it takes is a bit of drive, a little knowledge, and a modest investment in equipment and any interested person can experience great joy and satisfaction making either beer or music.